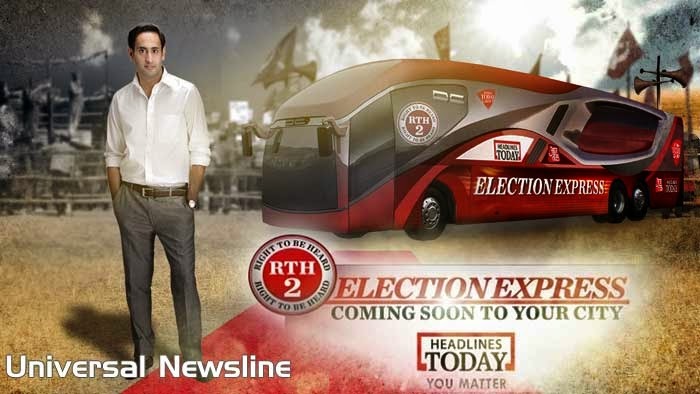 New Delhi April 8th, 2014 - Headlines Today takes News reporting to the next level by launching a mobile studio in the form of a state of the art Bus designed by none other than acclaimed automobile designer Dilip Chhabria himself. This one of a kind Bus boasts of a complete Newsroom Studio with a multi camera setup and a dedicated production control room. The bus stands apart not just for the futuristic look but also for being a complete mobile studio with facility to do live shows while ensuring amenities like an on board shower and toilet. The Election Express Bus is a result of the TV Today Network’s thought leadership to be always ahead of the times with ground breaking initiatives to bring News to the viewer. In the run up to the Elections, the custom built Election Express Bus will travel across the key battleground states for over 45 days to bring local issues of national significance to the forefront by news coverage and Interviews from ground zero. This initiative is a product of the idea to take Election Coverage out of the studios and into the heartland that will decide the fate of the upcoming elections. In addition to key Interviews with Leaders and Ministers during the journey across cities, the Election Express will give a glimpse into the mood of the nation with interactions with people across markets, restaurants etc along the way. This marvel on wheels will redefine how News Reporting is done by giving an in-depth perspective to viewers on Election.